Of course, the last photo was indeed of Mt. Arbel, with the Kinneret / Sea of Galilee in the background. So congrats to Warren, Sarah, Ilana, Benny, Laura and Shmuel for getting it right. Mt. 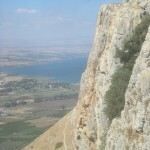 Arbel is a highly recognizable mountain rising above the northwest corner of the Kinneret valley. Its northwestern face is a particularly sheer cliff. Thus, Mark‘s guess was not so far off. He thought it was a photo of the Manara Cliffs that rise above the Hula Valley, in Israel’s far north. But both the Hula Valley and the Kinneret Valley are a portion of the larger rift valley that runs the entire length of Israel from top to bottom (north to south). This is a giant gash in the Earth that formed when two tectonic plates split along the longest faultline in the world: the approximately 6000 km (3700 mile) long Syrian-African Rift. Both sides of this rift valley, in Israel and in Jordan, are lined with cliffs, and it is this same rift that actually accounts for why the Dead Sea and Lake Kinneret exist. And of course, seeing the Kinnerret below the mountains was what led Sharone to make her guess. So she was also making a logical guess. 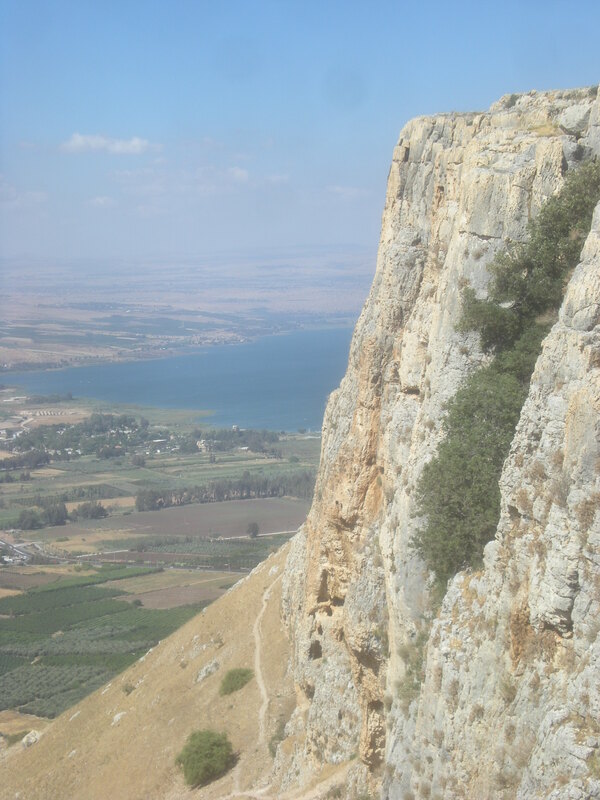 Rising almost 400 meters above the surrounding area, Arbel is one of the best spots to get a view of the Kinneret, Golan Heights and most of the Galil / Galilee. You can get a virtually 360-degree view of the region, and can also spot some of the significant sites throughout the area. But Arbel is also well known for its antiquities. Firstly there is a beautiful Byzantine-era synagogue that was in use for over 300 years. It’s white limestone structure stood out against the black basalt stones of the houses in the surrounding village (a similar situation to the synagogue in Capernaum), and though largely typical of Galilee-style synagogues, there are a few unique aspects as well. Still, the most famous and exciting part of a visit to Mt. Arbel is a visit to the caves halfway down its cliff face. A visit to them is not for the weak or faint of heart, but well worth it for the adventurous history lover. The circular trail that brings you to them takes approximately 3 hours, parts of which take you along a narrow path running along the cliff face. Parts require you to make use of ropes or hand/foot holds. But the thrill is worth the effort, and the story connected to them is pretty dramatic too! So he hit upon a dangerous and daring plan. Jospehus continues and explains that Herod had his soldiers lowered down from the top of the mountain (the area where you might first get your panoramic view) in chests or cages, from which they were able to make their attacks. Of course, the rebellious Jews’ end was a tragic one. The soldiers slaughtered men, women and children, even burning some of them alive. So Arbel is a great spot for a visit with so many different things to offer. A great view, a beautiful ancient synagogue, a challenging hike and a dramatic and tragic story. Now if you have guesses on the current Mystery Photo, please leave your comments below. They will remain hidden until I post the next one. 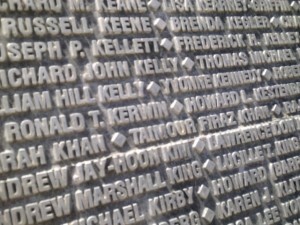 This is an easy one for me because my husband took me there while studying for his tour guide exam! 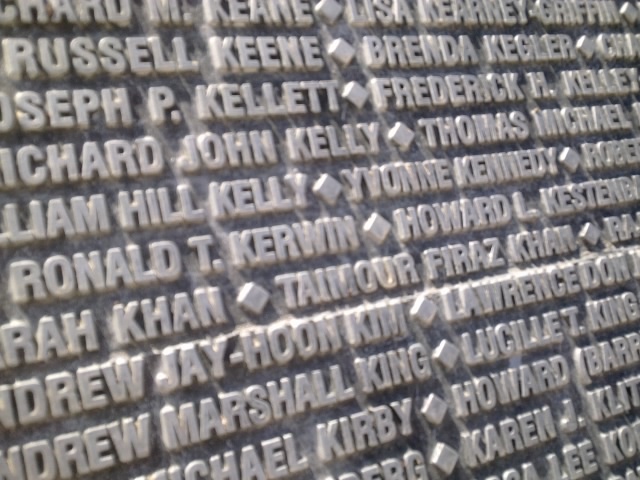 It’s the memorial for 9/11.